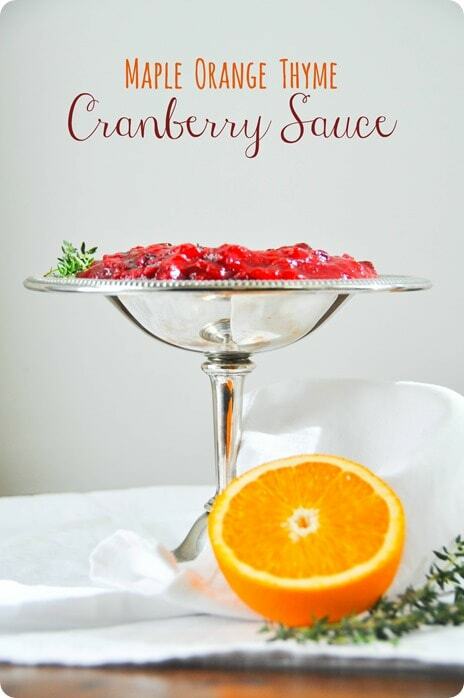 I have a treat for you guys today, just in time for Thanksgiving: an easy homemade cranberry sauce recipe! This flavorful and unique cranberry sauce is free of refined sugar and as easy as it gets to make. Sweet, tangy, and bright, it can also be made days in advance to save time. 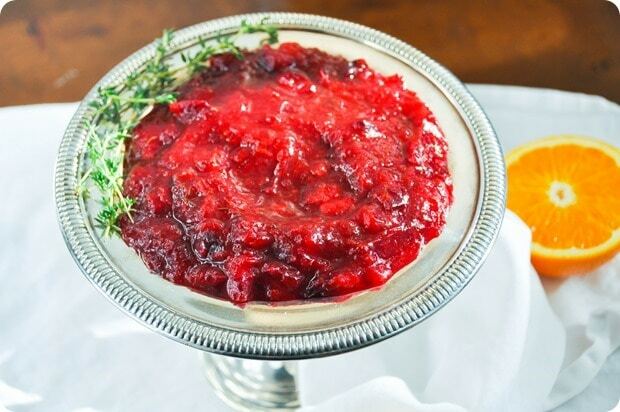 Cranberry sauce is one of those things that can be really awesome or really gross. 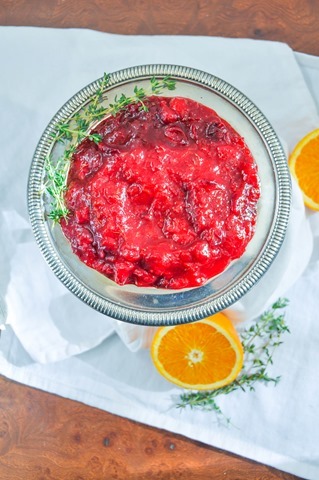 You know what I’m talking about – cue the canned weirdly gelatinous cranberry sauce, made from a tiny bit of actual cranberries but mostly just corn syrup and who knows what else. If you normally use cranberry sauce out of a can, please try this recipe instead. It’s super easy, much tastier, and way healthier, too, with actual real food ingredients and no refined sugar. All you need is: fresh cranberries, maple syrup, a fresh orange, and a little fresh thyme (this can be omitted to make the recipe even simpler, if you like). Once you have your ingredients, you simply toss everything into a pan, stir over heat, and it’s ready. Easy as that! 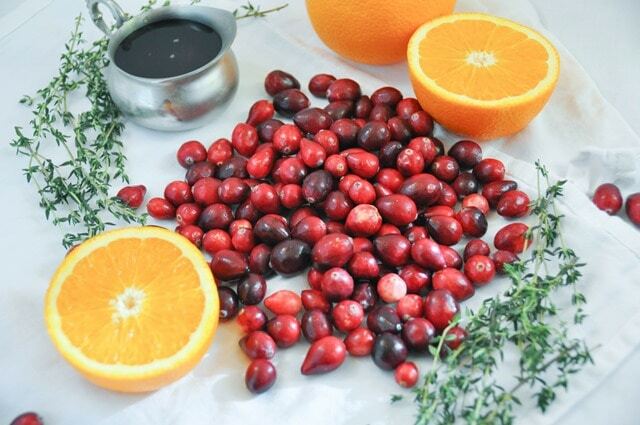 10 minutes later and you will have way better than store bought homemade cranberry sauce! Garnish with a little extra thyme to make it look super fancy. 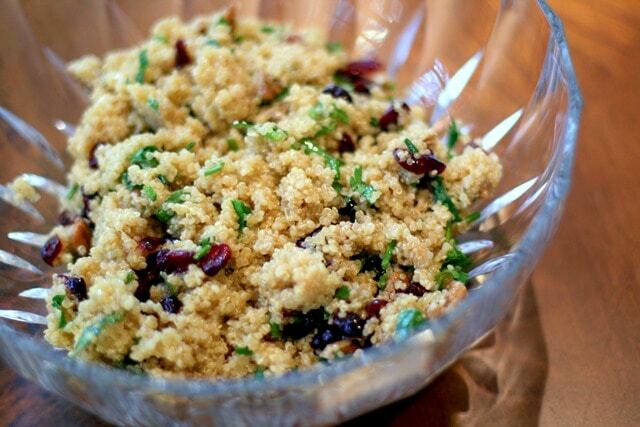 Make this ahead of time if you like and store in the fridge for a few days, to free up stovetop space on the big day. Bring mixture to a boil over medium-high heat. Reduce heat to medium-low and continue to cook, stirring occasionally, until the cranberries have popped and the sauce has thickened (about 7-10 minutes). 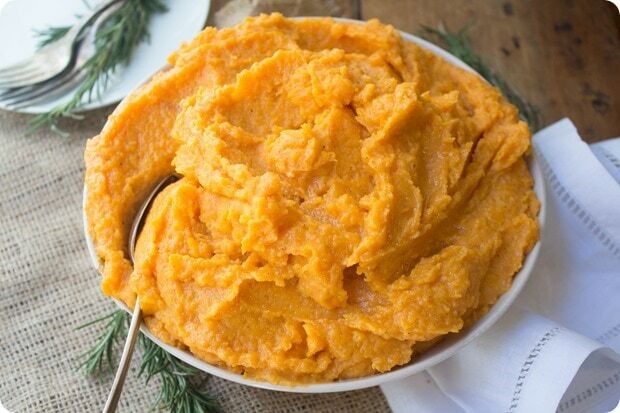 Spiced Mashed Sweet Potatoes – Delicious with no sugar added! Quinoa Salad with Pecans and Cranberries – This recipe is from our wedding, and is an old favorite. 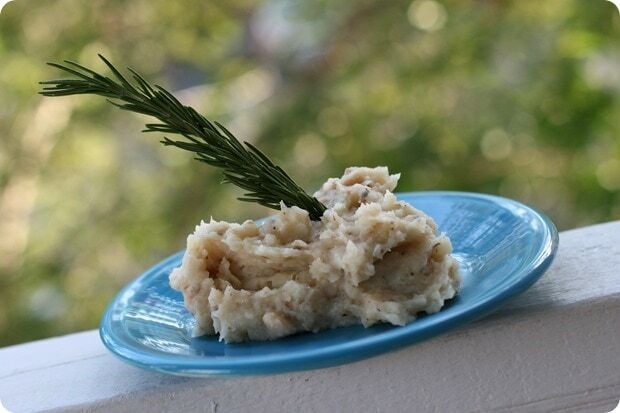 Healthy Mashed Potatoes – These taste (and look) like normal mashed potatoes, but the nutrition is amped up with mashed cauliflower and cannellini beans. They’re vegan, too! 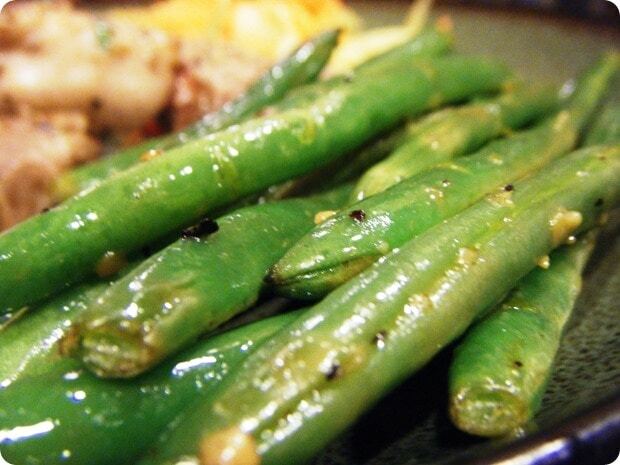 Lemon Garlic String Beans – Another old favorite. Delicious and easy, these make a great side! Pumpkin Bean Dip – This is one of my favorite appetizers! Want a really easy non-pie dessert? Try my Sweet Potato Whole Wheat Bread Pudding. 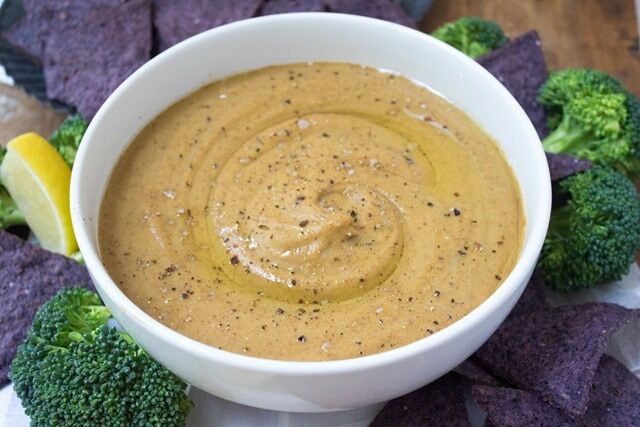 The recipe works with canned pumpkin, too! Here’s How to Make Brussels Sprouts Delicious. You’re welcome. What’s on your Thanksgiving menu this year? Love this suggestion for cramberry sauce! I have some Thanksgiving shopping to do this weekend. Happy Friday! 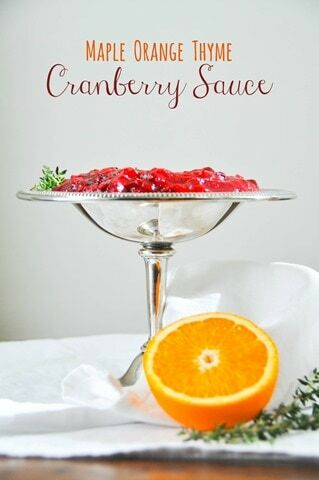 I’ve always not been a fan of cranberry sauce. The one thing I wouldn’t eat as a child! But I need to re-try making my own! I did 2 years ago…it was okay…but there is mass room for improvement! I make a homemade cranberry sauce similar to this every year. It is so simple and so delicious! I will never go back to canned! Ohh I love the idea of adding maple syrup. 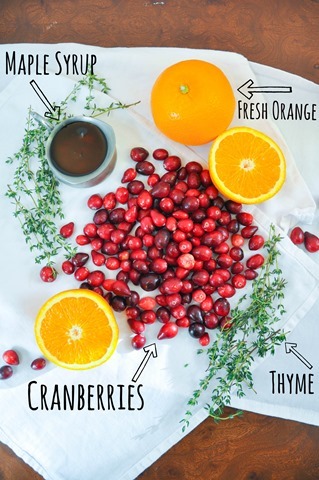 I just discovered a cranberry sauce I finally liked (at Whole Foods) so this opens up some exciting Thanksgiving food possibilities for me! I love the idea of adding thyme to the sauce! I have tons still growing in my garden. Also, your pictures of this recipe are so beautiful! The colors really pop. great idea to use pure maple syrup instead of sugar! 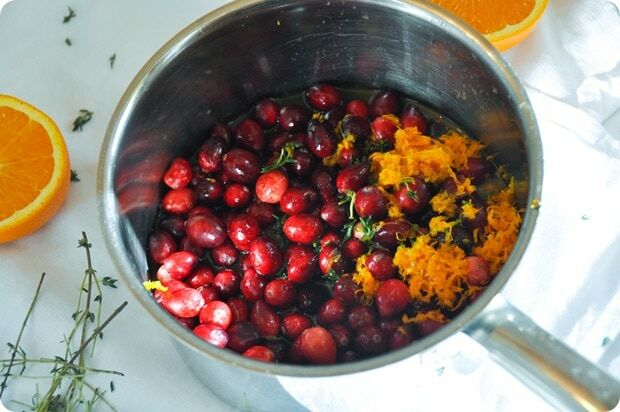 I have been looking for a different way to cook cranberries ,I am so happy to try this recipe . So healthy for you and delicious at the same time, thank’s for the recipe. Loving the addition of thyme. I bet it adds a certain savoriness? Yep! Anyways love fresh herbs to amp up recipes a notch. I’m going to make this today and have 2 random questions: If I double the recipe should I also fully double the syrup? Worried it may be too much. Next question, any thoughts on whether sage could work in the recipe? Or is that too random? Yes if you double it I’d double it all! 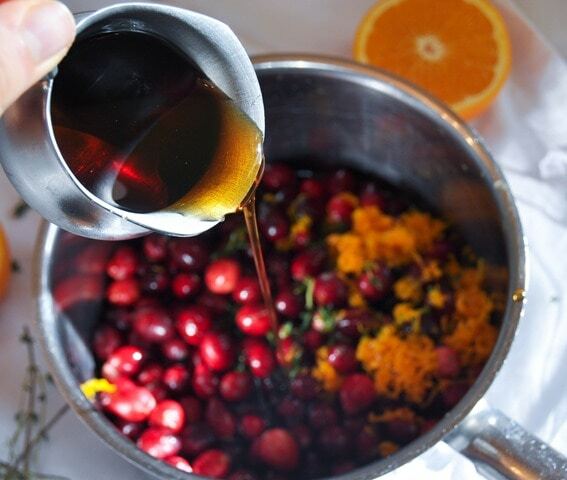 You could add less syrup if you are nervous and taste it before adding the rest but that should work fine. Not sure about sage, but it would probably be good! Anne, I just made your cranberry sauce – and I LOVE it!!!! It’s so delicious and at the same time super easy to make – I am going to serve it to duck tomorrow! Some of my friends were already intrigued as I was sending them some pictures during the making :). My parents always buy the canned stuff. It creeps me out that it comes out in the same shape as the can, and I think was why I wouldn’t touch it for a number of years! This year I spent Thanksgiving away from them since I live in London now, but sent them this recipe as one to try since it was SO simple – they tried it and LOVED it, as did I for my expat Thanksgiving! So easy, so delicious, and not can-shaped :) Thanks Anne! Ps….I pick wild mountain berries in the Yukon Territory. They are tart and high in antioxidants. The maple syrup is delicious to add to them. I have a honey business as well and honey is equally as good! This sounds really good. I don’t eat any sugar so I was wondering if I could replace the maple syrup with 1/2 cup of juice from an orange? Should I add a splash of lemon as well?